(Community News Service) On a brisk mid-September morning, Gallatin County Democrats circled around a rippling blue tarp, one adorned with sequins and glitter, and grabbed an edge of the wave. 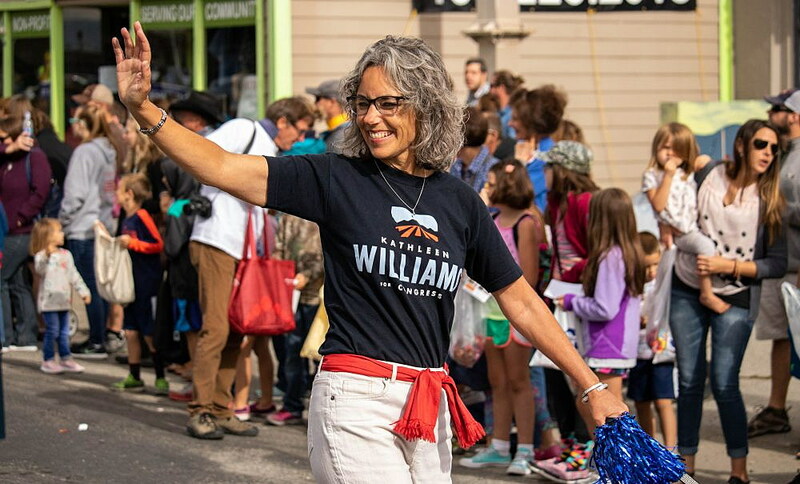 The group ran through a couple of chants as staff and volunteers waited for Williams, the Democratic nominee in this year’s race for Montana’s lone U.S. House seat, to join Belgrade’s Fall Festival parade. Ahead of the “blue wave” delegation was another, a sturdier interpretation of Democrats’ hopes for this election. Hauled by a white truck, it was made of wood and netting and painted blue and white to fit the part. Volunteers carted children in a Radio Flyer while seniors supplied spectators with information on candidates and volunteer opportunities. They mingled before the march down Main Street. 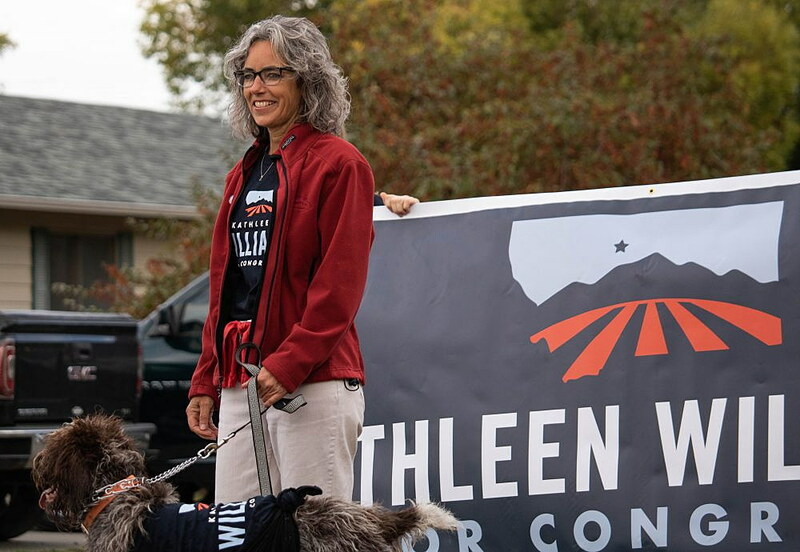 They practiced the chant three times before Williams’ campaign camper, freshly decorated with American flags and a splash of “Kathleen Williams for Congress,” took its place in the parade. “She’s the obvious choice,” said Elizabeth Marum, chairperson of the Gallatin County Democrats. Marum, who joined Williams on a panel advocating the protection of Social Security a few days before, said she is frustrated with how she cannot reach incumbent Congressman Greg Gianforte, who lives less than 10 miles away. She said the only time she has met him was in Washington, D.C. “Kathleen wants to talk with us,” she said. Williams’ campaign for a seat that Republicans have held since 1996, contrasts with her opponent’s. On the issues, she touts her stances on health care, the environment and public lands, tax inequality, guns and abortion. She favors allowing people ages 55 to 64 to buy into Medicare. She supports restrictions on high-capacity rifle magazines and military-style assault weapons. She has vowed to fight efforts to restrict abortion rights and to protect Medicare and Social Security. She says she support tax cuts, but has criticized Trump’s cuts for favoring the wealthy. She says Gianforte’s has limited comment on withdrawing some public lands from wilderness protection. Her campaign also differs in style. She has less money, for starters. According to the Federal Elections Commission, Gianforte has raised over $7 million for the House race to Williams’ roughly $800,000. She doesn’t have a full-time staff. She buys mostly digital media ads, which are cheaper than TV ads. She ziz-zags across Montana in a camper, talking with gatherings large and small. Williams, 57, has lived in Montana for 24 years. She was born in a U.S. Army hospital in San Francisco. She was her parents’ fourth girl and last attempt at a boy. She spent her formative years in Colorado and Oregon, developing a passion for the outdoors, recreation and natural resources. The Rocky Mountains held a special attraction. Williams earned a bachelor’s degree in natural resource economics at the University of California, Berkeley. She followed with a master’s degree in natural resource policy from Colorado State University in 1990. After that, she went to Oregon for six years, but she missed the blue skies and white winters of the Rockies. She phoned state capitals in the Intermountain West, hoping to return to the place she loved. Helena called back. “It’s been the first place that ever felt like home to me,” she said. In Helena job, she worked as a nonpartisan staffer with the Montana Legislature. She researched bills regarding mining, water and natural resources. Shortly after, in the middle of a five-year drought, she became a water program manager, working with farmers and ranchers to balance their water needs with the health of fisheries. “Through hard work and people committing to solving problems, we found all sorts of win-win-win solutions,” she said. Subsequent experiences exposed her to other issues. In 2010, she won a seat in the state House as a Bozeman Democrat. She served for six years, then took some time before she announced her campaign for Montana’s sole U.S. House seat. In Belgrade’s parade, Williams walked with her dog Danni between the crashing wave and her campaign camper. Soon after it was over, she drove her rig five hours to Kalispell where she spoke at the Flathead Democrats’ annual Harvest Dinner. More than 360 people attended, the biggest turnout ever, according to host Andy Shirtliff. Attendees orbited several rows of tables, each stacked with a steel chafer. Piled within were the means for tacos, with other dishes on the side. Attendees meandered and mixed as they served themselves. Speeches peppered the night. Williams gave hers last. She described her background, her experience. She shared the five core pillars of her campaign: fixing healthcare, fostering opportunity, protecting the environment and America’s outdoor heritage, returning civil discourse to a broken Congress and rebuilding America’s place in the world. Some components of her campaign were lost to the shortage of time. As soon as the speech was finished, Williams said a quick farewell, gathered her staff and drove back to Bozeman. This story was produced by the Community News Service, a service of the University of Montana School of Journalism. Contact student reporter Tmothy Pierce by email at timothy.pierce@umontana.edu.